PennDOT's District 2 — which includes nine counties in the northcentral part of the state — has seen a steep decline in its injury rate since the implementation of the "Safety Culture Initiative" in 2014. But one county in particular has been excelling in the safety arena since well before then. As of May 16, Cameron County maintenance and the Cameron County regional repair facility together have combined for 3,203 days without a disabling injury. That's more than 8 ½ years! A disabling injury is defined as an injury or illness that requires professional treatment and results in lost time from work other than on the date of the injury. The last such injury at Cameron County maintenance occurred nearly six years ago, on July 21, 2012. At the Cameron County regional repair facility, the last disabling injury occurred March 25, 2015 — a streak of more than three years. John Pagano, assistant highway maintenance manager for Cameron County, attributes this success to a consistent focus on safety and identifying the safest way to complete the task at hand. His crews have adopted the mentality that if something doesn't look or sound safe, then it probably isn't. And instead of proceeding, crews stop what they are doing and problem solve to come up with a way of completing the task that will keep everyone safe. Pagano also gave credit to those who work behind the scenes for maintaining this consistent focus on safety. Emphasis on safety doesn't start and end with the crews, but is evident from those in the office down to the mechanic that works to ensure all the equipment is properly maintained. That mentality is spreading across District 2. PennDOT uses a formula established by the U.S. Bureau of Labor Statistics to calculate upward and downward trends in work-related injuries. The goal for work related injuries is 4.32 or less. As of May 16, the injury rate for District 2 was at 3.8; the rate for PennDOT as an agency was 4.45. 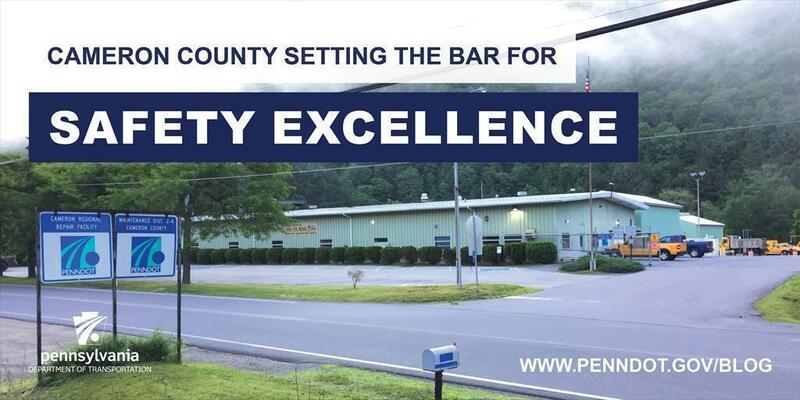 While Cameron County is setting the bar for safety excellence in District 2, the district office, Clinton County maintenance, and Mifflin County maintenance have all gone more than a year without a disabling injury.